I'm from the midwest & lived in the cornbelt. Summer driving always had us checking out the landscape, trying to decide if the corn plants were "knee high by the Fourth of July." Typically they were. Corn is the landscape of my childhood. But....I have experienced the difficulty of shopping with a roommate years ago who was allergic to corn. Corn is in EVERYTHING! 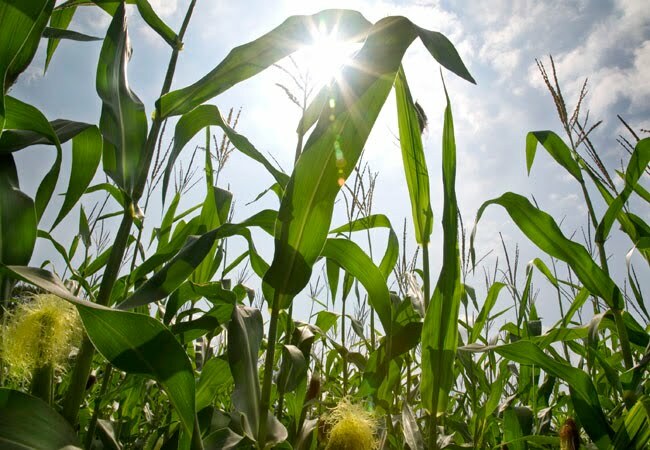 Beyond the obvious: corn...it is also in corn syrup (esp the "high fructose" variety), corn starch, dextrose, maltodextrin, MSG (monosodium glutamate), and GDL (glucona delta lactone) which is an additive in cured meats. Gee...aren't those a lot of the preservatives in the 2-inch list on processed foods?! It's also in our hair. Our hair?!? We consume so much food with all of the above (plus we eat meat with either corn filler or from corn-fed cattle/poultry), that we are essentially made of corn. An amazing movie that starts with a hair analysis that elicits a verdict of corn, follows 2 guys fresh out of college to the heartland where they decide to harvest an acre of corn, harvesting a lot of corn facts a long the way (some of which are very disturbing). 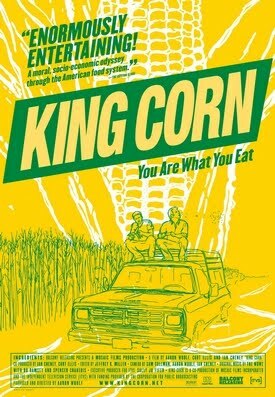 "King Corn" is that movie, and it totally changes the way you look at the corn industry. It's a great chaser to "Jamie Oliver's Food Revolution!" To see the trailer for "King Corn" and learn a little more about the movie...go to http://www.kingcorn.net/ or click the title above. Follow it up by renting it! It's a fabulous, eye-opening movie! !